Happy “whatever” to you, dear readers. Today’s comic was inspired by our visit to our local RSPB bird reserve at Otmoor, yesterday, where we saw and heard an astonishing murmuration of starlings (estimated at around 50,000) swirling around above us and finally coming down to roost in the reeds. My point-and-click photo doesn’t begin to do it justice, and of course there’s the sound of the wings and the calls too! 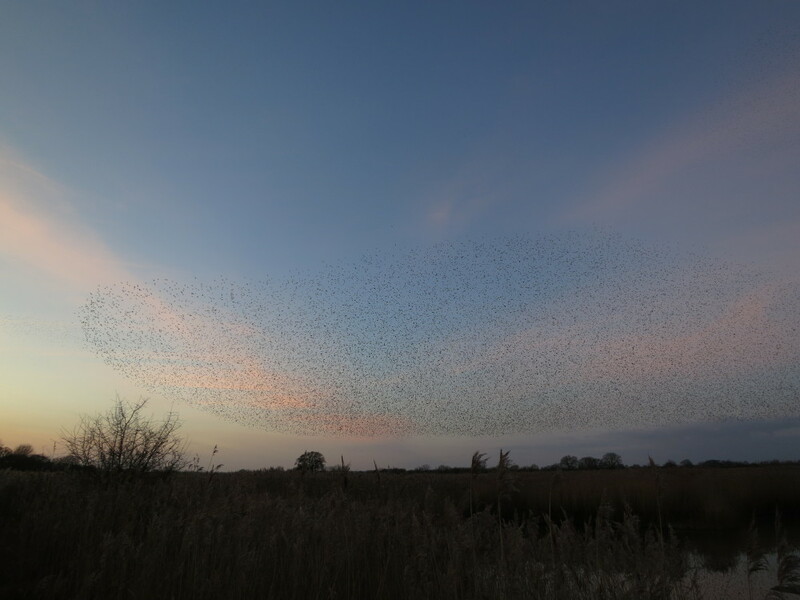 If you get a chance, enjoy this sight while you possibly can — starlings are on the critical list and in serious decline. UPDATE: Karen put up a video of this on her blog. "I don't feel like going out again this evening. How about we stay in and have a nice, cosy murmuration here - just the two of us?" It was amazing, and somehow sad all at once. I though about having the caption: “Hello Neighbour — nice comet you have here. Do you need a jump start?” Please suggest any other captions in the comments. Alien [out of flying saucer] to Philae lander: Excuse me, neighbour, could I trouble you for a cup of sugar? Our Bed and Breakfast hosts, during our little jaunt to the South coast, were at pains to point out that the shower drain is not blocked, simply slow; and that we could regard the water sloshing around our toes and ankles as a relaxing foot-bath at no additional cost. However, by the time I’d finished washing my hair I was worried to observe that the water level was just above the top of the shower tray. The shower drains a little more slowly than is usual.